Have you seen this? Y'all know my love of lingerie and I'm so weak right now! I can't buy it 'cause I don't have any money anyway...I'm adding this to my wish list though! I just came across this the other day when Mikhaela talked about the lady behind the patterns. She's an illustrator so that bumps her up in my book by about a billion notches. 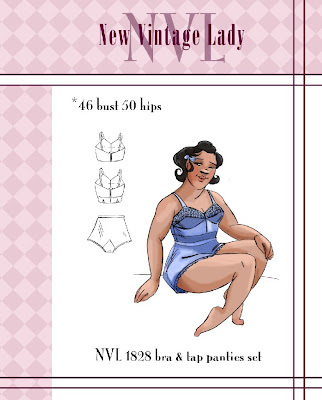 If you're plus sized and love vintage definitely check out her vintage repro pattern line. So cool! More Test Sewing and Mabe Some Jeans? As I mentioned before I'm testing one of the two new Colette patterns coming out soon! My results are due today so i need to get crackin'! Don't worry, I'm really almost done! I also read that Pattern Review is having another Jeans Sew-Along. I'm thinking of joining or at least following along. Believe it or not, I've never made myself a real pair of jeans! I've made capris with a fly opening and made my DD some shorts that have jeans stylings but I've never made myself a pair of jeans! I have plenty of denim so that's not an issue. I have lots of jeans zippers from the thrift store too. I think I have everything I need now I just need to find the guts to do it! LOL! On a side note: My friend who lost his job found full time work! YAY! So now I'm watching their girl full time on through the summer till I start school. I'll probably be sewing for her a bit more. It is oh-so-much fun making little things! For those of you who don't celebrate Easter I wish you a very Happy Spring! !